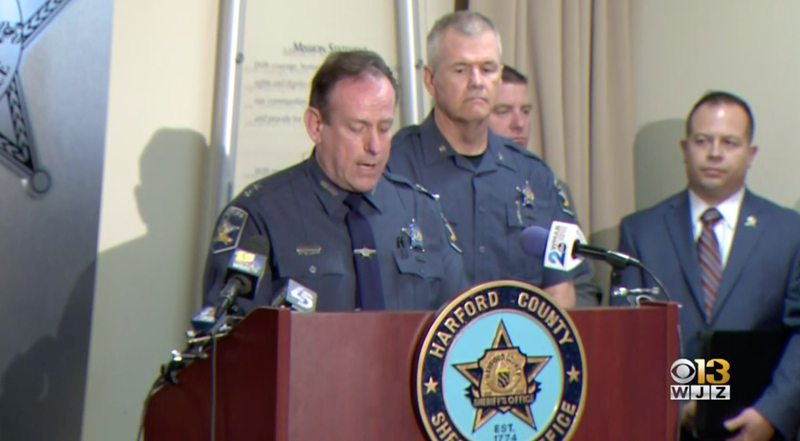 Harford County Sheriff Jeffrey Gahler speaks about the alleged racial profiling by a deputy during press conference Tuesday at the Sheriff’s Office Southern Precinct. The complaint was filed late last month by Rashad James and his attorneys, and centers around an incident at the Harford County District Court where James was questioned about his status as an attorney. According to the complaint, James was at the courthouse on March 6 to expunge a client’s record. After identifying himself as a lawyer to the judge and successfully arguing for the expungement, a deputy approached James and asked him to identify himself—apparently concerned that James wasn’t a lawyer but the client he was representing. James showed ID to the officer, but the cop pressed him for more identification to prove that he was attorney. After taking James to an interview room, during which time calls were made to James’ office to verify his identity, James was released. But according to the Harford County Sheriff’s investigation, James was at least partially to blame for the confusion. Michael E. Davey, an attorney for the Harford Deputy Sheriff’s Union, said the incident occurred when James approached the assistant state’s attorney and didn’t clearly identify himself as a lawyer. The prosecutor knew the defendant in the case had an open warrant and alerted the deputy, a 36-year veteran, that the defendant was in the courtroom, Davey said. When the case was called, James identified himself as an attorney. The assistant state’s attorney indicated her confusion over the lawyer’s identity to the deputy at that point and the deputy had a conversation with James first in the courtroom lobby before asking him to come into an interview room, Davey said. James, a Maryland Legal Aid attorney, did not have a business card or a Maryland State Bar Association Courthouse Identification badge, and presented the deputy with a North Carolina driver’s license, Davey said. Eventually, the deputy was able to verify that James was an attorney. The entire incident lasted about five minutes, Davey said. It’s still unclear why a North Carolina driver’s license was an issue, especially since it presumably matched the information James gave (and more importantly, would not have matched his client’s information). James’ attorney, Andrew Freeman, pointed this out in comments made at a follow-up news conference on Tuesday. James was not asking for money or for anyone to get disciplined as a result of the complaint—just an apology. Given the results of the investigation, it seems unlikely he’ll receive one. In fact, the president of the Harford Deputy Sheriff’s Union believes James owes the deputy who questioned him an apology.